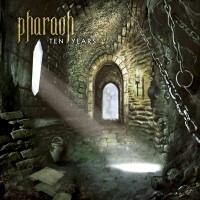 PHARAOH, the US Power Metal band featuring ex-CONTROL DENIED singer Tim Aymar, first came to my attention in 2008, at the time of the release of their third album”Be Gone”, following “After The Fire” (2003) and “The Longest Night” (2006). See my review here. As it is known, the band was formed in 1997 and while awaiting the fourth full-length the band decided to celebrate their first 10 years in the form of an EP called… “Ten Years”, and this on the 7th June. This contains six tracks: two new songs from the “Be Gone” recording session, two songs previously released only as a bonus 7″ and two cover songs (NEW MODEL ARMY’s “White Light” and SLAYER’s”Tormentor”). As you thus can expect, this release is aimed at the fans in particular. The EP starts with the title track, which takes off instantly with pounding melodic Power Metal. This flows over neatly into the straight-forward verses where Tim’s powerful singing cannot be ignored. This is good stuff, on all levels. The chorus is catchy and the music also comes pounding out of the speakers. The melodic aspect comes out very well. Before the calm break and the return of power afterwards, there’s a solo (and a good one!). But there’s solo stuff near the end as well. All in all, great stuff to begin with. “When We Fly” has a building intro, albeit a short one, and then all hell breaks loose. This is again straight-forward power Metal with an epic touch. The solos are of course mandatory. This song as well, flawless. Which brings us the first cover, “White Light”, originally by NEW MODEL ARMY. I have never heard of this band or this song, so I briefly checked on YouTube and even if it’s not Metal, PHARAOH gave it a light Metal injection. This Rock song is very well executed and Tim’s singing is nicely adjusted to the lack of aggressive riffs and thundering drums. “Reflection And The Inevitable Future” is a midtempo rocker of a song with the production sounding a little different from the first two songs. Melody is important in the chorus, where you’ll find hymnic singing, too. The musicianship in general is of course very solid. “Nothing I Can Say” then is another midtempo rocker where the melodic aspect is much higher, and yet the music seems to have a Doomy character. Things get more powerful and driven in the chorus. And again I have to hail Tim’s vocal input. He’s truly an exceptional vocalist. Room for solos was also taken into account. The EP ends with the SLAYER cover “Tormentor”. Compared to the original, PHARAOH did a very good job here as well. Back then SLAYER didn’t sound as Thrashy yet, so neither does PHARAOH. “Be Gone” was a very pleasant album, even if it took several listens to fully appreciate the songs, since there was always something else to check out (vocally and instrumentally). I liked it a lot. Since no real news came from the band since then, the EP comes as a surprise, but a positive one, as you get two unreleased songs from the last album recording session, two songs that were released elsewhere (not on the albums) and two covers, which show that PHARAOH can go relatively broad. In short,”Ten Years” is, in my humble opinion, a must for those who like what these guys play. If you’re unfamiliar with PHARAOH, go for the albums (first). Other than that, the appetite for the fourth album has been ignited.